Goodwell, Okla.—The Panhandle State men's and women's basketball teams took two Sooner Athletic Conference wins over Bacone College Saturday afternoon at Anchor D Arena. 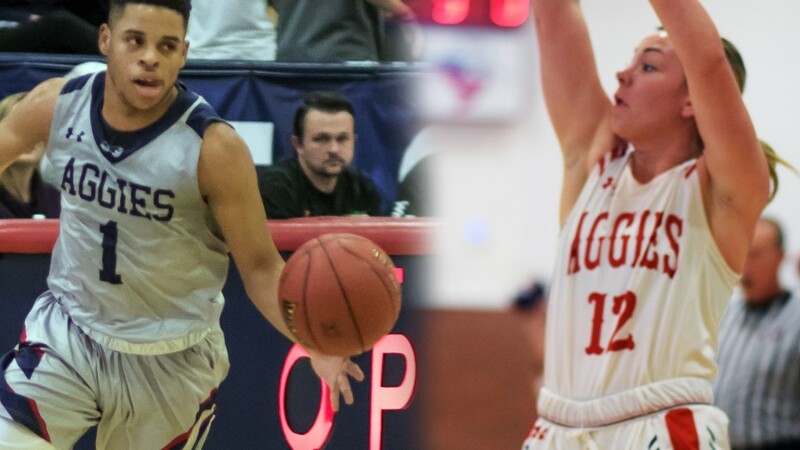 The Aggie women broke a four-game losing streak with an 85-32 victory over the Warriors, while the men's team marked their second win of the week 87-79. Addison Munsch led the Aggie women with a game-high of 19 points, and fell just shy of a double-double performance with nine rebounds on the day. She matched a game-high of four assists with Taylor Acosta and led in steals with three. Acosta added 14 points for Panhandle followed by Nadia Hayes, who hauled in 12 points and seven boards for the game. Monti Regier led the game beyond the arc tallying nine points, all form three-point range. Off the bench, Naomi Rodriguez led with nine points and Samantha Davis and Hannah Bennett each brought down seven rebounds. The Aggie women saw improved shooting efforts averaging 41.4 percent from the field, including 40 points scored inside the paint. The team totaled 22 points off turnovers and 16 on second-chance shots. At the boards, the Aggies outmatched their opponents 48-31. With the win, Panhandle State stands at 9-8 on the season and holds the No. 7 position in conference standings with a 5-6 record in the SAC. Head Coach Victor Esparza commented, "It was a good game overall for us to get some confidence for our upcoming road trip." He added, "I thought we responded well to halftime adjustments and I really like the fight in our team right now." Esparza noted, "We hit a rough patch over the last few weeks, but we are ready to get that turned around and battle in the second half of conference play." The men's team faced a formidable matchup as the Warriors gained as much as a ten-point advantage in the first half. The Aggies pulled together to claim a four-point lead (37-33) at the break. After halftime, the Aggies edged out to an 18-point lead (62-44) at the 10:10 mark. Bacone battled to within three points, but Panhandle persisted with great efforts on both ends of the court. For the game the Aggies shot at 48.5 percent and totaled 42 rebounds. Breiman Alexander totaled a game-high of 22 points and notched a double-double with ten rebounds. Alan Hodge, Jr. also posted a double-double performance with a game-high of 11 boards and ten points. Jaedon Whitfield was one rebound short of the same attainment, totaling nine rebounds and 20 points on the day. Kahllid Edwards and Baris Ulker also broke the single-digit scoring barrier with 18 and 13 points respectively. In addition, Edwards led the game in assists with seven and in steals with three; Ulker had the game's only block. The Aggies now hold a 10-7 season record and stand 5-6 in conference play to rank seventh in SAC standings. Pleased with the win, Head Coach Aaron Coombs still sees room for improvement offering, "We have higher expectations than how we played today. We have to be better if we're going to achieve the goals we set for the season." Coombs continued, "Any win in this league is hard and to get a win when we did not play our best, we will take it." He adds, "Five conference wins is the most this program has seen in recent history; it's a nice milestone to achieve." The coach wrapped up commending, "I'm very proud of Alan Hodge and the way he defended and rebounded when he was having an off day on offense." This week the Aggies face two road games against conference contenders, meeting with the University of Science and Arts Oklahoma in Chickasha on Thursday, Jan. 24 and Mid-American Christian in Oklahoma City on Saturday, Jan. 25. USAO's men's team is currently ranked No. 20 in the nation, while the MACU women received votes in the latest national poll. Fans can follow along with live stats and video streaming offered online at opsuaggies.com.